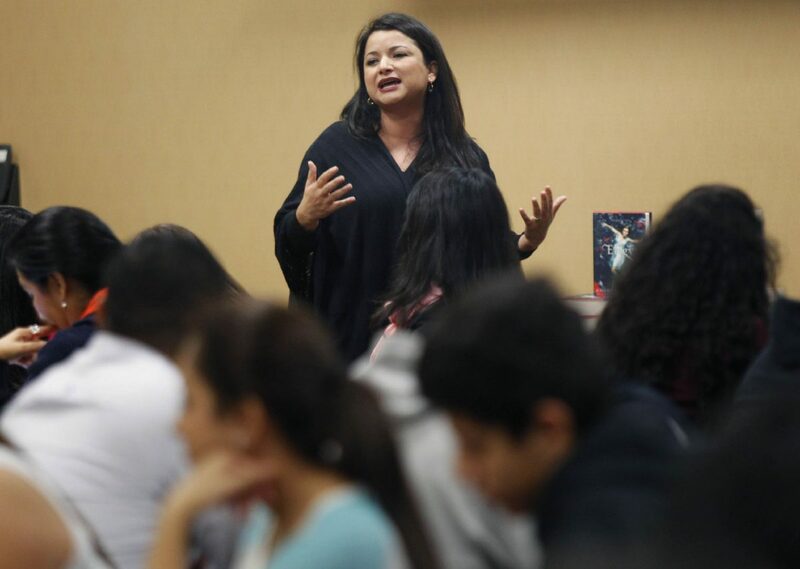 Macarena Hernandez talks with local Gear Up students during a writing workshop Thursday Nov. 11, 2015 at the Region One Academic Center in Edinburg. Hernandez, who grew up in La Joya, is a writer, editor and a journalism professor at Baylor University. EDINBURG — The University of Texas Rio Grande Valley secured a continuation of a seven-year $21.2 million federal grant intended to continue guiding at-risk students in the area toward a college education, especially in science and technology fields. The university receives about $3.1 million per year for seven years from the U.S. Department of Education to fund the initiative, which sends university staff to three school districts – La Joya, Edinburg and Brownsville – to coordinate with and council middle school students and their families on their path to college and even their initial years in college. “We hope to build a very solid foundation of support systems that can help students and families truly understand the pathways to college and to be the point of contact for these students and families over the seven-year period,” said Sylvia Leal, associate vice president for student educational outreach at UTRGV and co-investigator for the grant. Each campus receives a counselor or staff member that becomes the primary point of contact for the students and their families and who will follow them along for the duration of the seven years. The schools identify seventh-grade students who might be at risk of not attending college due to lack of understanding of the process, mainly due to them being the first to attend college in their family or not having the support system at home. The districts were chosen based on the impact opportunity that these present, Leal explained, the university needed to identify districts large enough to include areas of high need, while also having large enrollment numbers and resources will be matched by the districts, totaling about $42 million. “We wanted to provide assistance to school districts that needed assistance but also that could have an impact because of high numbers… to provide maximum impact on outcomes,” she said. The university estimates this grant will be used to impact about 3,900 seventh graders. The impact could be higher considering they also provide staff development for teachers to help identify students in need for guidance. These resources stay in the schools and follow the teachers wherever they go, therefore possibly impacting many students outside the grant. This grant is not the only grant intended to provide this type of guidance. The university has recently renewed about $3.4 million in federal grants for similar programs that encompass other school districts in the area including Educational Talent Search, Upward Bound and Upward Bound Math and Science, Leal said. College preparation summer camps, for example, are attended by about 4,616 students, while advance placement trainings are attended by about 536 teachers. In total the university receives about $7 million annually to fund these initiatives. These initiatives have the same purpose but they have different approaches, Leal explained. GEAR UP has more of a systemic approach in which they look at the entire environment surrounding the student to address any issues with a college pathway and reshape the approach. This includes leadership trainings for school teachers and administrators, informational sessions for parents and other outreach resources. In an area such as the Valley, where most of the student population comes from lower economic backgrounds and most are first in their family to reach the college goal, Leal said there needs to be a variety of approaches to provide as much support as possible.